Diana Collins has a lot on the ball these days. The longtime Nashville resident is a regular league bowler at Donelson Plaza Strike & Spare and other lanes around Music City and serves as president of the Music City Senate of The National Bowling Association. Oh, and she’s the mother of baseball superstar Mookie Betts of the World Series champion Boston Red Sox. Betts, 26, a 2011 graduate of John Overton High School, is the reigning American League Most Valuable Player – and a pretty darn good bowler. He’s so good, in fact, that he competed in the World Series of Bowling a little more than a year ago, rolling a perfect 300 game in a qualifying tournament. He’s got a couple of those to his credit. But make no mistake – baseball is his calling, the sport in which he could dominate for the next decade. Already a three-time American League All-Star, the Red Sox right fielder has achieved legendary status in Boston, where his every move is closely followed. “It’s really funny seeing Mookie as a celebrity, you know? A lot of people look at him as a celebrity, and I still look at him as Mookie,” Collins says. “I’m so excited because who would think that you would play major league baseball, would be the MVP? That’s just incredible. 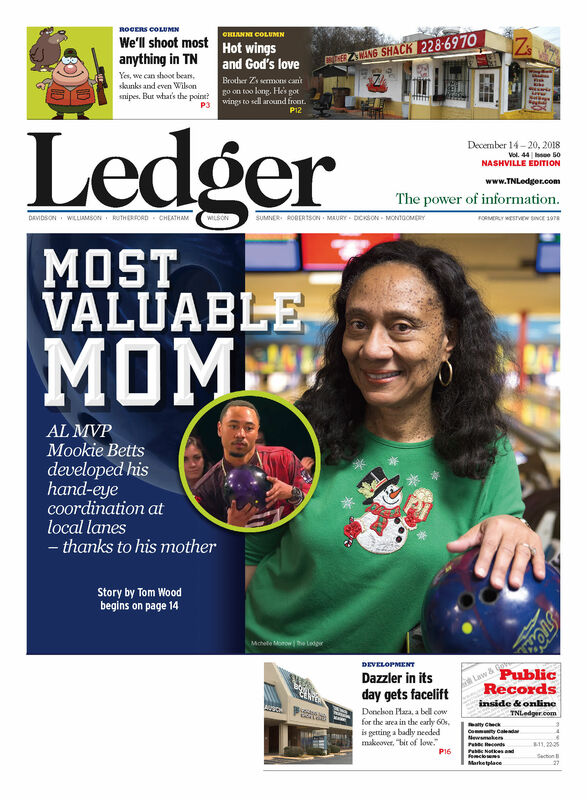 When: Saturday, Dec. 15, 2 p.m.
On Saturday, Dec. 15, Collins will take on the role of tournament director of her son’s fourth annual “Christmas Bowling Tournament and Fundraiser with Mookie Betts and Friends” at Smyrna Bowling Center. Betts is spending the time leading up to the tournament in California working on his hitting in preparation for the 2019 season. So his mother explained the whys and hows of the bowling fundraiser. “What we do is we take funds from Mookie’s tournament and help senior citizens and underprivileged kids and families with medical hardships,” Collins explains. “So, (the TNBA fundraiser) is the way Mookie can give back to the community. 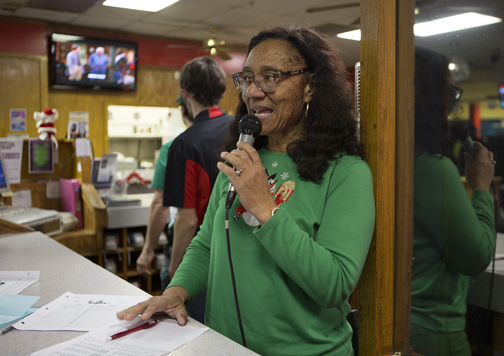 Diana Collins, who serves as president of the Music City Senate of the National Bowling Association, makes an announcement to league players before bowling at Donelson Strike and Spare. Collins moved to Nashville in 1986 and started bowling in various leagues a couple of years later. When Mookie was born in 1992, she adds, it seemed perfectly natural that he would accompany her to the lanes, taking along the playpen to keep a close eye on him. By age 3, Mookie was wanting to join mom on the lanes, and that’s where he developed his love for the sport. “He wanted to try it, and I got him out there, and he actually started pushing the ball with two hands because he wasn’t strong enough to release with his fingers in it,” she recalls. Soon, Mookie developed a keen eye that would carry over to baseball, a sport he began playing at age 5. But Collins remembers a pivotal moment in Betts’ athletic progress on the bowling lanes at about age 4. That’s when she recognized his potential. 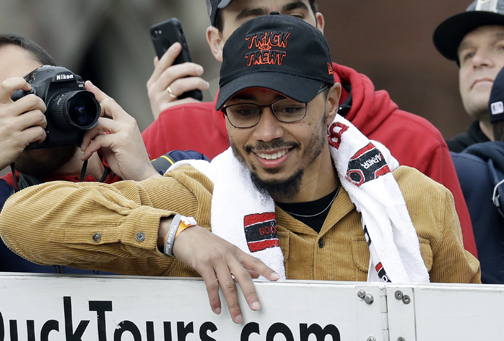 Boston Red Sox’s Mookie Betts is all smiles during the parade celebrating this year’s World Series championship, his first. The Overton High graduate was later selected as this year’s American League most valuable player following his fourth full year as a major league player. “He would look at a certain place on the bumper to know where to put the ball so he would hit some pins,” she explains. “I would say something like, ‘That’s real good, Mookie. Now take your eyes and look a little further down the lane,’ or whatever. And then we tried a different shot. And he would follow instructions and really do well. “When he was strong enough after a couple of months, I got the lightest ball they had and started teaching him how to put his fingers in the ball so that he could roll it. Collins says her son was born with a competitive spirit that she encouraged. “Mookie liked anything and everything that involved a ball. If it involved a ball, he played it and he loved it. He just liked playing; he’s competitive. So, we played ball. I played with him. What makes Betts such a good bowler – or great baseball hitter? Someone qualified to answer that question is Larry Schmittou, a former Vanderbilt baseball coach, founding owner of the Class AAA Nashville Sounds and owner of 14 Strike & Spare bowling centers in four states, including Donelson Plaza, Hermitage and Hendersonville. Hand-eye coordination is defined as “the way that one’s hands and sight work together to be able to do things that require speed and accuracy (such as catching or hitting a ball),” the Merriam-Webster dictionary states. Schmittou says that definition should be accompanied by a picture of Betts. “To be real good at bowling – and a real good hitter – is total hand-eye coordination. He’s got that,” Schmittou explains. “It’s pick up the spin of the ball, or to lay it on a certain board in bowling. Because there’s 40-some-odd little bitty boards (on the lane), and a real good bowler will come in and say, ‘I’m going to lay it in the first game on the eight wood.’ And there’s oil on the lanes and, as the oil breaks down, they will adjust. Combine that hand-eye coordination with Betts’ competitive nature, and he is one formidable hitter and fielder – and bowler. “Some people say bowling’s not a sport. That means they don’t know how to bowl because to the ones real good at it, it’s a sport. It’s a very competitive sport; it’s also a recreational sport. “It’s kind of like saying ‘I’m a runner.’ OK, that means you go out and jog. Can you win a marathon? No. So bowling’s the same way,” Schmittou says with a chuckle. Schmittou admits he only casually knows Betts through bowling and baseball. “I admire also that he’s remained the same. I don’t know him very well, but when I do see him, he’s still very polite, very down to earth. He’s got a good support group and peers. He’s got the world by the tail right now,” Schmittou adds. Credit Collins for that down-to-earth humility. Betts certainly does and has in past media interviews. “It’s just kind of one of those things where it seems like a dream and I have to pinch myself and say, ‘is it real?’ Every parent wants their child to succeed, and so I would be really no different than any other parent. I’m happy for him and want him to continue to be successful,” Collins adds. “You just want to keep the child grounded, you want to keep him humble, you want him to try to keep going forward. You don’t want a child to forget from where he came because things happen, and you want to be honest with yourself and just be humble. And that’s why this weekend’s bowling fundraiser is such a big deal. “It’s hard for me to grasp sometimes. We’re out eating, and people want to take pictures with him, and Mookie just wants to be a normal kid,” Collins says. And bowl like normal people. He doesn’t get to bowl on the local lanes as much as he used to, part of the price to be paid for winning the MVP award. In an era of flashy athletes, Betts is old-school – much like the Donelson Plaza Strike & Spare lanes where his mother competes weekly in a Friday night league. The 24-lane venue has seen numerous upgrades over the years, but still retains that traditional bowling alley feel. “Bowling is bowling, you always have 10 pins, the lanes, the same setup. So, it’s all about fundamentals. So, it’s all about the crowds and the atmosphere, and that’s what I think you have here (at Donelson Plaza),” she says.